We had two days of very strong winds followed by 11 days of pleasant light/medium winds so there were opportunities to sail and race every day. 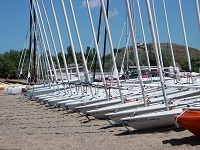 I joined in the "sunset challenge" races at 4:30pm daily with up to 16 boats participating. There were plenty of boats both for beginners and for the more experienced. The Lasers generally won the races, with the Topaz CX catamarans close behind. The Lasers were more nimble and skilfully sailed, while the cats tended to be faster on broad reach but often lost much time when tacking and were unable to make as good VMG when sailing close to the wind. The short length of the race legs mitigated against spinnaker use due to the time and trouble getting it up and down. Many children enjoyed the water sports and it was encouraging to see several taking part in RYA training courses and, at the end of the week, receiving their certificates - maybe they will become future round the world sailors! Twenty new, good quality, mountain bikes were available with comfortable saddles and a variety of sizes. The instructor, from Scotland, was very helpful, either leading a planned group tour or allowing you to cycle off on your own. We went twice into Myrina town, visiting the harbour, castle and shopping areas. See red line on the map. 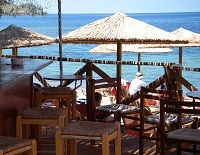 When we went as a group we went to a brilliant beach bar for coffee - and back there again on a later occasion! 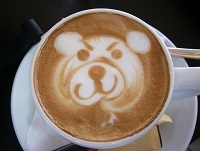 See the teddy bear chocolate powder motif on my Cappuccino coffee. See the marker on the map just to the north of Myrina for the cafe location. 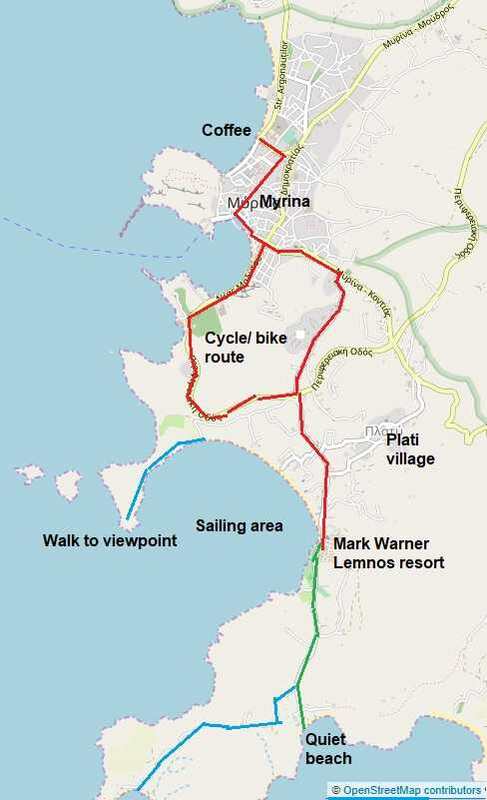 We made other self guided trips on bikes to the tiny harbour on the south of Plati bay, to Stivi beach (due south - green line) and to Cape Tigani (south west - light blue line). Directly opposite to the resort was a long promontory round the north side of Plati bay. The low hills along this promontory looked interesting and we resolved to investigate. On the Sunday we walked as far as we could on the beach and then onto the first knoll via a gate in the fence. The path was tricky, sloping sideways and with loose gravel. See dark blue line on the map. Not recommended for other than experienced hill walkers. The low vegetation was rather scratchy on the legs. We make our way along the slope of the cliff and via several ups and downs finally got to the tip of Cape Diavatis. All was deserted and we did not see a soul all the way. It was nice to look, approx 1 mile, back across the bay to the resort. It took us about 90 minutes, but I suspect that we could have sailed across in 10 minutes with a fair wind. The resort location was a perfect setting overlooking a quiet bay. Being at the end of the road meant very little passing traffic. Breakfast and lunch were in a buffet style upstairs restaurant with indoor and outdoor seating. Evening meals were at a terrace restaurant near the pools. It was most memorable to be sitting in the open air, eating dinner and waiting for the sun to set over Mount Athos in the west. The food quality and wide choice was excellent. Free wine was available for those that wanted it. The room accommodations were in blocks spaced up the hillside behind the main central bar and reception. There were significant slopes and steps to negotiate. No problem to the many fit young people with children but not ideal for the infirm. A compensating factor was the excellent bay views from the rooms. Free WiFi was provided, with a weekly password. 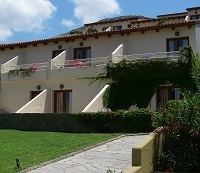 The resort catered for very many young families with children with excellent childcare, looking after the children right up to bedtime. Evening entertainment for the adults was limited. On three evenings during the first week there was Greek music, a disco and line dancing, the last enthusiastically organised by the Mark Warner staff. During the second week we asked if we could have a Scottish Country Dance Ceilidh. This we organised and having sorted out how the radio microphone and CD player worked we ran three dances, Dunnet Head, Virginia Reel and Strip the Willow. The Scottish Dance Ceilidh turned out to be quite a success. Virtually everybody travelled on a BA flight from Heathrow, terminal 5. Most people stayed one week. Food was good and we had a pleasant half hour coach transfer to the resort. Page started 24 June 2014, amended 31 Mar 2019.